Ducks Don’t Hold Grudges. 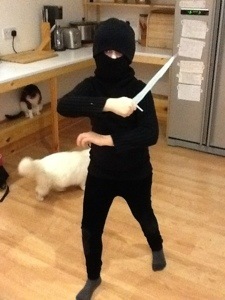 Oh, and watch out for the ninja. It’s been an awfully long day and I’m very tired, so when I wandered bleary eyed through the door 11 1/2 hours after wandering out bleary eyed this morning I wasn’t expecting to be greeted by this! Umm… Yeah. So apparently she’s now a ninja. I guess I shouldn’t expect any less. After all, I decided to be a frog yesterday (which continues to go well. I left today with stuff still outstanding and instead of being stressed out, I realized that it will still be there tomorrow and no-one will die – for those of you who are raising an eyebrow at this point, it all becomes clear in this post). It just reminds me that the girls have developed the quirky sense of self that I always wanted them to have. Being girly is fine if that’s what you want to be, alternatively wear a top hat and monocle, or nab daddy’s hat and become a ninja until its bedtime. I’m writing this sitting with them as they settle down for bed and the pair of them have opted to read to themselves instead of a story from me. It’s just another sign that they’re growing up and learning to love the world of imagination that books let you get lost in. I hope they never lose that and by adulthood, beanpole will be just as inclined to dress up like a ninja for the day on a whim. Ducks. They don’t hold grudges (technically, neither do frogs, but for the sake of this metaphor lets stick with the feathery pond creature). Having started to let things go, it’s become quite addictive and I was thrown another literary curve ball today with the statement “ducks, they don’t hold a grudge”. Are ducks very stressed? I have no idea, I guess they might be if you started to talk about hoisin sauce in a threatening manner to them… But in general, they swim about, occasionally have a jostle with another duck who’s barging in on their bread time then they swim off as if nothing had happened. They don’t actively avoid the bread stealing duck. They don’t shun the other duck for being a bread pirate. They quack their piece and its done. I’m not a duck today. I’m still busy being a frog. I’ve been sitting on my lily pad contemplating the ducks though. I realized that actually, this ability to step back from my racing panic thoughts isn’t something new. A while back when I was in a less than pleasant place, I had a bit of an epiphany whilst driving the car. I remember it clearly – I had just turned onto a roundabout and was freaking out about something that was worrying me and I just heard myself inside my head tell me to calm down and stop worrying as it can’t possibly be so bad that I need to crash the car and the panic went away. It felt like an hour going around that roundabout, but when I turned off I consciously realized that I was actually capable of coping with more than I gave myself credit for. Within six months of that epiphany, I had got my life more together and whilst I have still been prone to fits of panic and self control to the point of insanity, I have maintained an inner monologue that means I can carry on for the most part. My goal is now to keep calm while I’m at it. Calm? Ok, no not calm, that suggests just suppressing everything. Pragmatic. 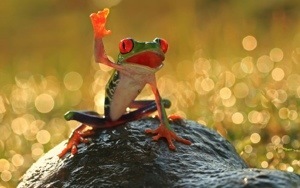 So, a pragmatic frog who seeks to let go of grudges. I feel very calm. I don’t often feel calm and it’s a bit weird. It’s the week of the mocks, the actual exam module results come out next week, my boss is away leaving me in charge of a major bit of school software and we’re neck deep in coursework. I shouldn’t be calm, I should be passing out with stress. It’s just that I’ve discovered stoicism and it’s hit a raw nerve with me. I feel I ought to explain the frog reference, but bear with me for just a little bit longer. The concept of stoicism is to look at situations that cause us emotional distress with a realistic eye. How bad could this actually be? Am I being irrational about how bad this actually is? And even if it isn’t an ideal situation, do I actually have the power to change it? Well, in a nutshell (there’s a fair bit more). I have been a princess for far too long. I had hugely high expectations of myself and those around me and was (ok, am) massively disappointed when people, including me fall short of these. I considered myself personally responsible for the actions or outcomes of those around me, and most importantly, I clung (cling) to familiar routines and places to create a sense of security. As such, I have lived in a constant panic that the throne might be moved from under me and I will fall flat on my arse. Instead, I’m aspiring to be a frog. I’m sitting on a lily pad and sunning myself. While I’m here, I’ll assess what’s going on in the pond and when the time is right, I’ll either dive into the pool or hop onto another lily pad to do some more rational assessing of my surroundings. Frogs don’t obsess over maintaining a kingdom. Frogs aren’t obsessed with constantly looking like the right kind of frog – as frogs go, squishy is about as good as it gets. Frogs don’t try to control those around them – if a stalk swoops, they take evasive action (or get eaten), but they can’t influence the stalk; if a fly lands close, they eat it. Frogs don’t have expectations of their surroundings – if the lily sinks, there are plenty more. Being a princess is high maintenance and bad for the blood pressure (as my GP has informed me on several occasions). Being a frog gives you the power to let things go. What good will it do to worry about the exam results now? I can’t change them. I did my absolute best to provide the best learning environment possible. What’s the worst that could happen if they’re bad? I could lose my grade 1 teacher status. People would think badly of me. Why am I so scared of that? Why is being ‘top of the class’ so important to me? Is this a need for approval? And if so, if striving for a seemingly unattainable goal is the only route to approval, then is it time to shift the goal posts? And is it in my power to do so? Because if I have no power to change it, then worrying won’t make a jot of difference and it could be a lot worse. So, for now, I’m a frog and it’s time to ride the lily pad. A quick thank you to a new follower. I most definitely am becoming a happster. Ribbit. I’ve been reading a book on how positive thinking can actually make you even more depressed than usual. (How very British!) but actually, I’ve put this theory into practice today. The idea is that you consider what is happening, what you think you want to do and consider why you are too scared to get off your backside and do it. When you think about it rationally, the worst that could happen is usually not as bad as what you are imagining, and actually the human condition can survive a hell of a lot. This isn’t about the pursuit of happiness, but contentment, or the absence of unhappiness. To be content, we need to stop thinking we must have everything. A term coined “musterbation”. Nothing like listing what you’ve actually achieved to create a sense of contentment. It’s mock exam week for our year 10s and 12s and I’m not sure who’s more stressed, me or them. Being one of those women who fully expected my A level students to have taken heed of my advice and spent half term revising and preparing for the week ahead, I had to forcefully prevent myself from twitching when I asked to collect in the practice papers that they had been given and was greeted with a collection of ‘oh I only did it yesterday’ and ‘I forgot that you wanted me to compare it to the mark scheme’. I know that it is ultimately their exam. I know I can lead a horse to water, but can’t make it drink. I have to confess to being a total control freak. I can’t stand to see them waste this opportunity to learn. I want to do it for them. I want to drip feed them so they get it. I am personally wounded by each incident of lacklustre apathy. These are the rantings of a teacher on the edge. Maybe. Or, these are the rantings of someone who loves learning and finds it difficult to understand why someone would not want to do their best, go a little bit extra, get that teacher’s pet award. Was I always like this? I remember being a total nightmare at their age. A pierced and tattooed punk/ goth who insisted that she wanted to be a fashion designer (and who later ended up studying computer science and being a software developer…. ). But despite rebelling against my perceived normality with bizarre hair and body decoration, I have always hankered after academic achievement. I have studied in a variety of forms for 33 years and still strive for my best (if I’m honest, I would have been devastated if my recent review had been anything less than a grade 1. In person, I would never admit that.). I’m actually not studying for anything for the first time in years and I miss it. I have a lot of other things to juggle now, and I’m still learning new programming languages and planning my next book. Oh, and teaching. I love teaching, which I guess is why I find it so hard when my students don’t take ownership of their own learning and give it as much enthusiasm and passion as I have for the subject. Maybe I’m deluded. I don’t care whether they love the subject with a passion and study hard because they need to learn more, or whether they despise a unit and aim for top marks because they’re going to prove me bloody well wrong. 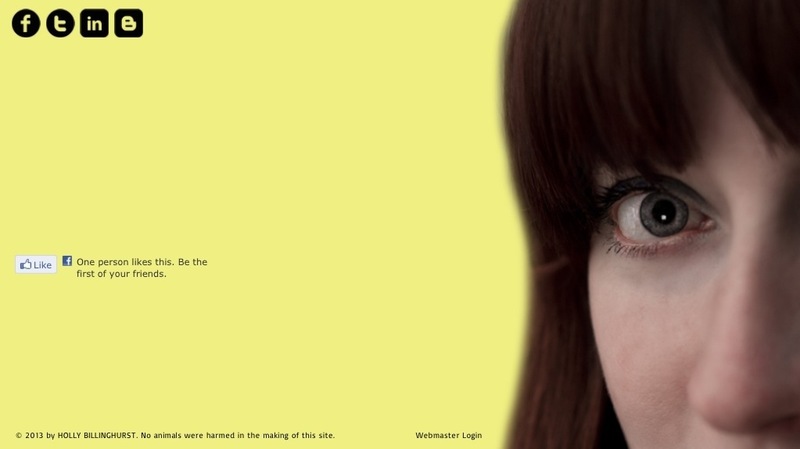 What I object to is apathy. We are the result of millions of years of evolution, we really ought to act like it. When students pop up with the trademark of Anonymous on their desktops, I start to wonder whether it’s time to have a real discussion about it. I’ve just sat and watched the BBC Storyville program about the group and was determined not to approach it with any pre-conceived ideas. Except I did if I’m totally honest. I see myself as an Internet savvy individual and someone who generally knows their stuff having worked and studied computer science and IT related areas for years. But, I am someone who has only come across Anonymous from the negative standpoint, and certainly whilst I find a certain amount of 4Chan amusing, they regularly push my envelope of decency over the table and into a puddle of dank water. So why am I back to considering discussing the role of Anonymous with my students again? Because this program made me stop and think. Really think about the movement and why this might appeal to the younger generation and what this may mean for them. Is this now something that we ought to be discussing as part of PSHE? Not whether they should take part or not – that is a whole other discussion – but the history of the movement, and some of the lessons which can be learnt from what happens when people act as a group to oppose something that is perceived to be immoral. I am aware that there is no way I could show my students the actual program (the language used was enough to make even me raise an eyebrow), but it raised so many discussion points and the involvement of the movement in the recent Arab Spring to provide a means of communication just hasn’t been reported. Why is that? It’s almost a lesson in the effect that the media has on our impression of groups in itself. I still can’t morally accept that a DNS attack is acceptable on a personal level, and the jump between memes and activism seems a very big jump (although humour is a good way to propagate an idea), but I can see why people who have strong beliefs would want to use the Internet to create a space for protest. In a way, that’s what I’m doing here – I’ve created a little bit of the Internet for my own thoughts, uncensored and laid bare for whoever happens to see them. 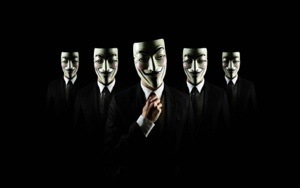 The title of this post is actually a quote from one of the ‘hacktivists’ when debating where Anonymous will go next. The offshoots of the group have created some seriously bad press for them in the media (especially in the UK), and the feelings linked with the group are often uneasiness with a group that attacks people when in fact it seems that the soul of the group is actually promoting free speech whatever your opinion may be. For now, I think I need some time to mull over the questions popping up all over the place and work out a way to integrate a balanced discussion into the classroom. Is that possible? I don’t know. Cue protests at my disbelief and slurs on my trust of their commitment to education. Now fast forward to an hour ago as I ready myself for my own return to work and their return to school…. “But our homework has to be in tomorrow!!!”…. This is the homework which magically appeared today and is suddenly MY fault for not letting them do it because we were out swimming, feeding ducks and going to the cinema. So here we are with two children sitting at the dining table in homework hell. With me and the long suffering husband taking it in turns to refuse snacks, redirect the wandering one back to the table, and mention to the beanpole that she isn’t actually going to die from doing a bit of maths. So what joys of education do we have this evening? 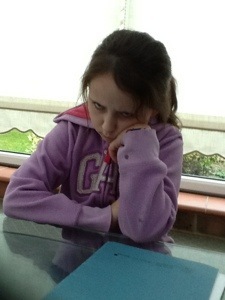 Well, tiny pants is writing a book report and seems quite enthused. We have one of her favourite poetry books out and I’ve given her a list of questions that she has to answer to make a good report. 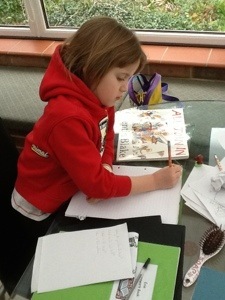 She seems to be following the instructions and aside from the occasional “how do you spell…” she’s got her head down. The bean pole is a whole other story. She’s on maths and we have some ‘instructional issues’. As in she has an inability to actually follow any. She’s been given a page of shopping receipts which she is using for long addition (kudos to her teacher for implementing some constructivist learning techniques, but who was the nail varnish for Mr C?!). The long suffering husband is making an attempt to guide her through the process and is getting increasingly flustered by her lack of willing participation and insistence on telling him that her way is the right way. I probably didn’t help by taking a photo of her enthusiasm for homework. So, how do we get past this homework block? My initial thoughts were based on shouting and other military drills, but actually I think the long suffering husband has got it right. He’s letting her do it her way (the teacher in me is screaming that it’s not the right way, but it is her way and I have to let her do it the way she’s being taught). He’s just sitting quietly next to them reading a magazine and offering occasional help. This is why I’m teaching other people’s children and not my own. I have the patience of bloody saints when it comes to other people’s moody teenagers, but cannot fathom why my own offspring just won’t sit down an learn. Alright, I’m two days late for this and I have to write this in five minutes…. What did my mum do that made her my mum? She worked. She worked so hard from the minute I was born until, well, now. When I was a toddler she went back to college to re-take her A levels and then got a part time job working in finance at the local college. Then as I went through school she studied even more and became a qualified accountant, but it didn’t stop there. While I stropped my way through high school, she studied for a business degree and gained a first. Since then, she has run her own department in the same college that she joined as a junior when I was four (I’m 33 now) and has consistently shown me through her actions that Success only comes before Work in the dictionary. I’m proud of my mum. She gave me my work ethic and drive to achieve my goals. I’m also proud of myself for not inheriting some of her OCD tendencies around the house which means that my kids are allowed to get dirty because ultimately they’re washable. I could probably do with a bit more of the ‘house proud’ gene. I’m not as sensible as my mum, I’m not as successful, but I’m me and I’m me partially due to her example. So, thanks mum. Keep up the good work.